Sharing my favourite piece of LP Thuat Rian made by LP Doo on 2532. One year before the master passed away. It is one of the most well known LP thuat made by LP Doo, widely known as "pert loke" means open the world. A sacred rian with the portrait of Luang Phor Thuad embossed on the front side and name of Luang Poo Doo of Wat Sa-kae on back, together with the Thai number identified B.E.2532. 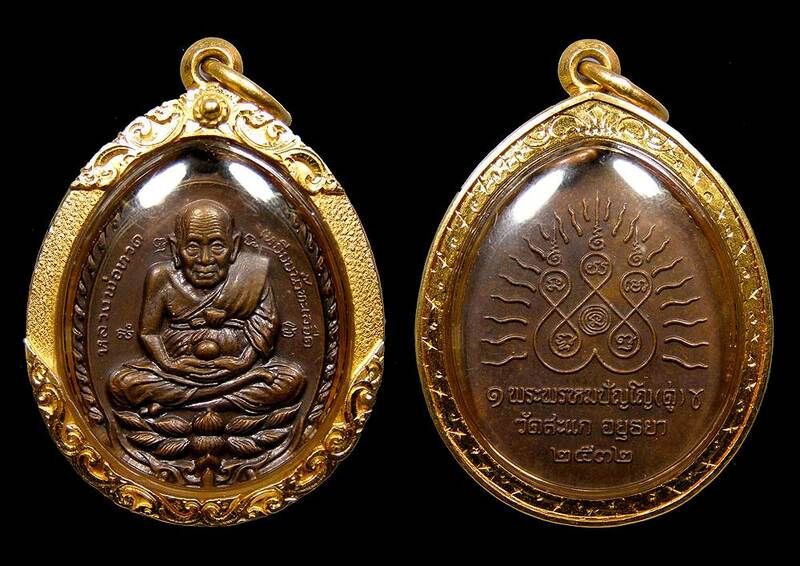 The followers of Luang Poo Doo revealed that Luang Poo Doo told them that while he was reciting the sacred spells to create the Rian Perdloke his mind could touch a miracle light that had penetrated into the three worlds (Heaven, hell and world of human being). This explains why it is called "open the world". Hope one day i can have the nur takua and nur silver as well. But silver rian is worth 250,000 THB now an gold one can go up to 1 million THB.